At night, growth hormone peaks between 10 p.m. to 2 a.m., the same time kids have growth spurts. You want to take advantage of elevated growth hormone by providing your muscles with the tools they need to grow. This means eating a snack with protein, such as cottage cheese, turkey roll-ups, or three to four ounces of leftover chicken before going to bed. At around 4 a.m., when blood glucose is sinking, another hormone, cortisol, triggers muscles to break down into amino acids, the building blocks of protein. These amino acids then get converted into glucose by the liver and normalize blood glucose levels so the brain has fuel to function. A bedtime snack can help maintain normal blood glucose levels overnight. Don’t exercise on empty in the morning. When you awaken in the morning, your cortisol levels are elevated and breaking down muscle. If you eat nothing before your morning workout and skip breakfast afterward, you stay in a catabolic (muscle-loss) state. This is a bad idea. A pre-workout snack, such as a banana, granola bar, or swig of orange juice can switch your body from being in muscle breakdown mode to muscle-building mode. 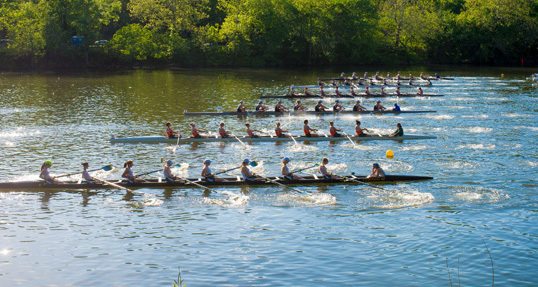 In late March, Michigan’s Adrian College announced it was adding men’s and women’s rowing to its growing roster of sports, making the private liberal arts college the first NCAA Division III program in the state to offer women’s rowing. Rowing camps can increase your recruitability. Up to a point.